You may or may not have known, but this past Saturday some of the top 2017 wide receiver prospects were in Indianapolis, Indiana taking part in the 2017 NFL Scouting combine. The coaches and scouts for the Dallas Cowboys were on hand and with the need to upgrade the wide receiver position, you can bet they were paying close attention. Penn State's WR, Chris Godwin, put on quite a show and could possibly be the Cowboys draft target on Day Two of the 2017 NFL Draft. I think he would be the perfect complement playing opposite Dez Bryant. Chris Godwin may have been the receiver that helped himself the most this weekend, because he ended up being one of the top performers in several of the combine events. He ran one of the fastest 40 yard dashes (4.42 seconds) and also finished as one of the top performers on the bench press with 19 repetitions. I personally thought his strength and speed showed up on his game tape, but it caught some people by surprise. Godwin is one of the more complete wide receivers in this draft class and as such would be the perfect complement to play opposite Dez Bryant. 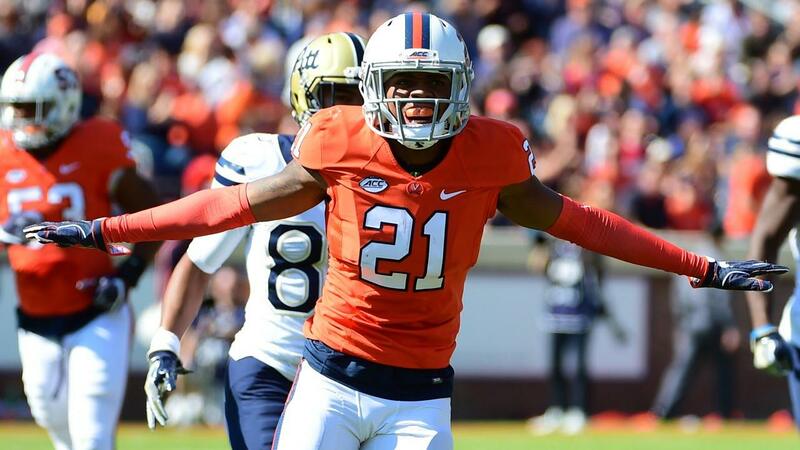 He is more than willing to do the dirty work as a blocker, is a strong natural hands catcher, has the speed to gain separation at the next level, and excels at coming down with contested catches. 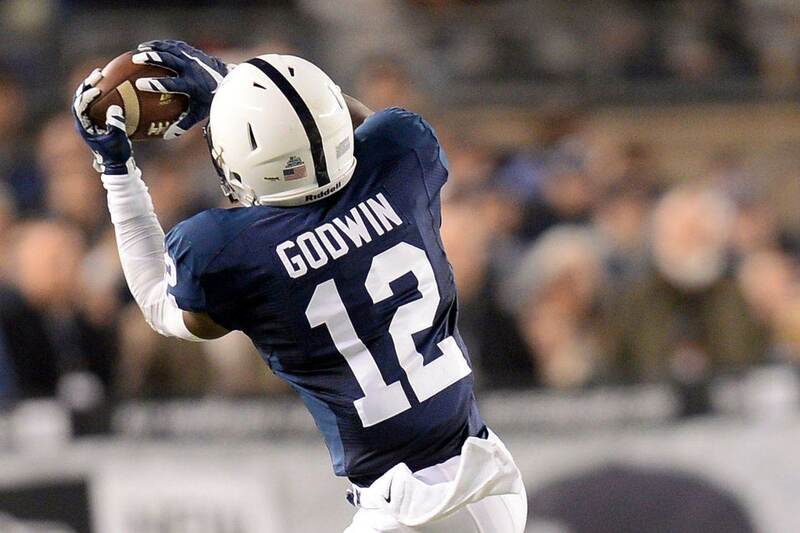 Let's take a closer look at why I believe Chris Godwin would be the perfect complement to play opposite Dez Bryant and improve the Cowboys passing game. I used his bowl game against USC to reference for this article, because his skill set was on full display. In the clip above, you see Chris Godwin not only make his assigned block in the running game, but he did so with authority. I could've gone with a number of different plays where Godwin stocks the defensive back and secures his block, but this one play shows his willingness to do the dirty work. This was no easy block to make. The safety was crashing down to make a play in the running game, so Godwin had to take the proper angle to make sure that he made his assigned block. Not only does he take out the safety, but it also takes out a defensive lineman who was working his way down the line of scrimmage to make the play. 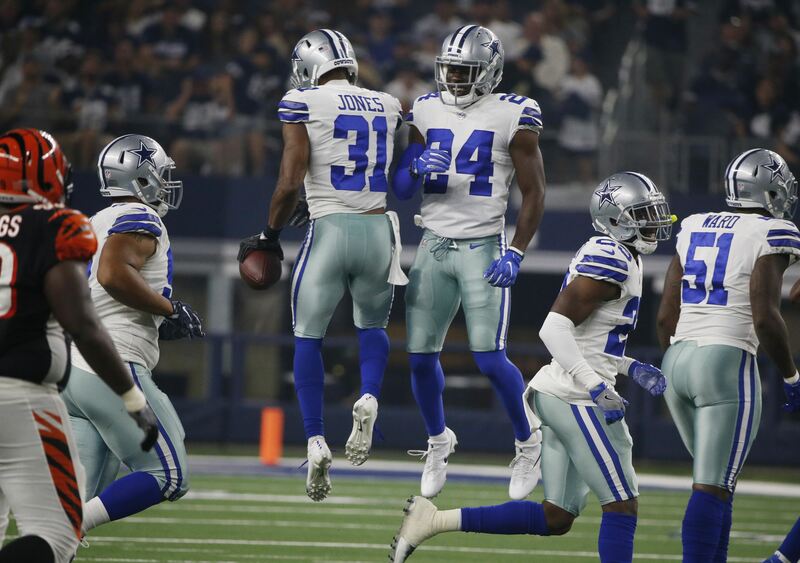 The Dallas Cowboys place high value on their #2 wide receivers being able to block in the running game and down the field. Chris Godwin has that ability in spades, which means there wouldn't be much of a downgrade from Terrance Williams' departure, who by the way was undervalued in this area. Let's take a look at his wide catching radius and his ability to catch the ball with his hands. This was a spectacular play made by Godwin. At the start of the play, you see him give a little stutter step to keep a little bit of separation between himself and the cornerback. You then see him carry his route up the field before giving a head fake to the outside and planting off his outside foot to break to the inside. There are three defenders in the area, so the quarterback throws the ball behind Godwin, where only he can make the catch. Godwin is able to stop his route and contort his body the opposite direction, all the while reaching out with his left hand and securing the catch. This was a 3rd and 9 play. Godwin's impressive catch not only picked up the first down, but put Penn State in field goal range. Now, let's take a look at how he uses that 4.42 speed and one of my favorite attributes of Chris Godwin's, his concentration. The first thing that Chris Godwin and his QB should have noticed on this play is that he is in single coverage. At the snap of the ball, Godwin is able to give a little stutter step to get a clean release to the outside. He uses his speed to gain separation down the sideline and all the QB had to do was drop it over the top for an easy TD. Unfortunately, the QB wasn't able to get enough on his throw, which led the CB to close the gap and make it a much more difficult catch for Godwin. The CB was able to tip the ball, but Godwin never loses focus and continues to track the ball to complete the reception for the touchdown. Chris Godwin wasn't used much as a deep threat at Penn State, but this is an area of his game that the Dallas Cowboys could utilize. His speed and concentration to make contested catches is something that opposing defenses will have to account for, which would open things up for Dez Bryant on the opposite side. Chris Godwin has exceptional strength and balance for a wide receiver, as evidenced by his 19 repetitions of 225 pounds on the bench press at the combine. You can really tell that he has put in the work in the weight room and it shows in the play he was able to make in the clip above. On this play, Godwin shows his ability to go up and catch the ball at the highest point. The cornerback is right there to make the tackle, but only manages to spin Godwin around. Godwin is able to regain his balance by using the "limp leg" and pick up another five or 6 yards. The "limp leg" drill is something we used to practice on a regular basis when I was playing. I don't know if that is officially what it's called, but it's purpose is to use your free hand to regain your balance and that is exactly what Chris Godwin does. Overall, Chris Godwin has all the physical traits that the Dallas Cowboys look for in their #2 or "Y" wide receivers. Before the 2017 NFL combine, I had a third round grade on him, but now I could see him slipping into the second round. If the Dallas Cowboys want to secure his services, they will likely have to use their second round draft pick (60th overall) on him. 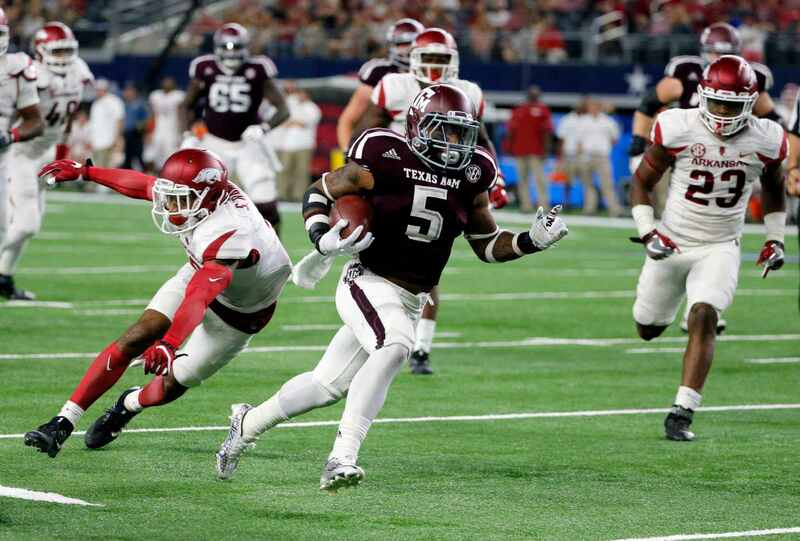 Drafting a wide receiver this early certainly is not out of the question, but with such a deep draft class, they could decide to address a position a little later. John Ross Breaks 40-Yard Dash Record; Out of Cowboys’ Range?